“Radicalization” has long been treated as the sole preserve of Islamists, even as far-right extremists have eclipsed them. Before Robert Bowers entered a Pittsburgh synagogue and opened fire, he spewed verbal bullets online. For months prior to the shooting Bowers made comments on Gab, a far-right social networking outlet created as an alternative to Twitter. There, Bowers posted numerous anti-immigrant and anti-Semitic comments. The Pittsburgh attack is not an isolated event. On February 14, 2018, Nikolas Cruz, 19, opened fire at Marjory Stoneman Douglas High School in Parkland, Florida. Seventeen students and school staff members were killed. And last year in Charlottesville, a car ran into a crowd of people protesting the white supremacist rally Unite the Right, killing anti-racist protester Heather Heyer. Subsequently, James Alex Fields Jr., who was driving the car, was charged with multiple hate crimes. For example, Islamic State, or ISIS, claimed responsibility for an attack on May 29, 2018 in Liege, Belgium. There, Benjamin Herman, who was on temporary release from prison, opened fire, killing two police officers and one civilian. According to Belgian officials, Herman became radicalized in prison. “There are signs that allow us to speak of radicalization in prison,” an official said. From the operational perspective, one can hardly distinguish between the attacks discussed above. What sets them apart, however, is the ideological leanings of perpetrators. Islamist supporters of the Caliphate are not behind all shootings and car-ramming incidents. Instead, a rising number of attacks are an outcome of another type of radicalization — the radicalization of the far right. Overshadowed in the media by Islamist radicalization, far-right radicalization has been quietly on the rise. In many countries, threats posed by far-right extremist groups have reached or exceeded dangers posed by Islamists. Researchers studying far-right propaganda activities have found that “white-supremacist Twitter accounts have increased more than 600 percent since 2012, and outperform ISIS accounts by every possible metric.” Far-right rallies and militant marches similar to the one that took place in German Chemnitz in August 2018 indicate that far-right groups have become a force to be reckoned with across the West. Some experts have already pointed out that Islamist and far-right radicalization have become co-dependent. Indeed, far-right and Islamist radicals have mimicked each other’s rhetoric and have used the same narratives. A study conducted by the Jena Institute along with the London Institute for Strategic Dialogue analyzed far-right and Islamist materials collected between 2013 and 2017 from Facebook, Twitter, gaming apps, and secret channels, and found that the two sides co-opt each other’s language. What seems to have gone unnoticed, however, is that the focus of countering violent extremism (CVE) programs on Islamist radicalization has also fed into the rise of far-right radicalization. Despite the different trends in violent extremism, in the post-9/11 era counterterrorism initiatives have almost exclusively focused on Islamist radicalization. In the U.S., the 2011 national strategy Empowering Local Partners to Prevent Violent Extremism in the United States prioritized Islamist radicalization and emphasized the need to protect Muslim communities. At the UN level, member states have also concentrated on religious radicalization. According to the UN Plan of Action to Prevent Violent Extremism, “In recent years, terrorist groups such as ISIL, Al-Qaida, and Boko Haram have shaped our image of violent extremism and the debate about how to address this threat.” The UN plan does not deal with far-right threats at the same level. The vast majority of country-level CVE initiatives have been predominantly designed in response to religious radicalization. Thus, many countries implemented new counterterrorism provisions in compliance with the UN Security Council Resolution 1373 (2001). But since the resolution itself was adopted in response to the Al Qaeda attacks on the U.S., UN member states introduced counterterrorism measures with religious radicalization in mind. On the one hand, this overt focus on Islamist radicalization has magnified the perception of the threat, which in turn has fed far-right sentiments. Many post-9/11 counterterrorism policies portrayed Muslim communities as breeding grounds of terrorism and contributed to anti-Muslim propaganda. In turn, researchers have pointed out that negative views towards Muslims and Islam make far-right movements more appealing. 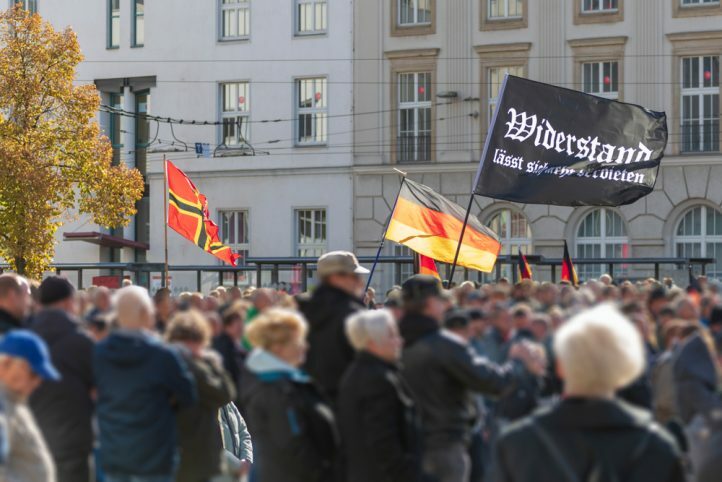 As a result, in line with predominant counterterrorism approaches, far-right groups have been able to portray Islamist radicalization as a source of societal problems. For example, in France, Marine Le Pen, the leader of the far-right National Front, built her presidential campaign around the threat of Islamist fundamentalism. “We do not want to live under the yoke of the threat of Islamic fundamentalism,” Le Pen explained. On the other hand, the overt preoccupation of counterterrorism measures on Islamist radicalization has created a sense of urgency among far-right groups. Thus, despite all the counterterrorism measures against religious radicalization, ISIS-inspired terrorist attacks continue to challenge governments worldwide. Among far-right groups this has created a sense that government is failing in the fight against Islamist extremists. Hence, far-right extremists see the need to take protection into their own hands. One member of far-right French group Operational Forces Action explained he became motivated this way by the November 2015 terrorist attack in Paris. “I had the impression that the state could not protect me and my family,” the member shared. Operational Forces Action subsequently planned its own “counterterrorism” activities. Group members were tasked with identifying at least one “fundamentalist” imam for potential assassination. The group also considered poisoning halal food in stores in areas with large Muslim communities, and planned to throw grenades at Muslims, mosques, and Islamic bookstores. It is time to reconsider our understanding of radicalization. Commitment to violence is obviously not the exclusive domain of Islamist terrorists — indeed, they may not even be foremost in the field. Policymakers and experts working with radicalization need to treat it as a multifaceted phenomenon it is, paying attention to the various motivations behind it, be it religious, far-right, left-wing, or single-issue. Far-radicalization has already led to violence, and needs to be addressed at the same level as Islamist radicalization. As we have witnessed by now, treating radicalization as the exclusive purview of religious extremists only breeds further radicalization without addressing the roots.